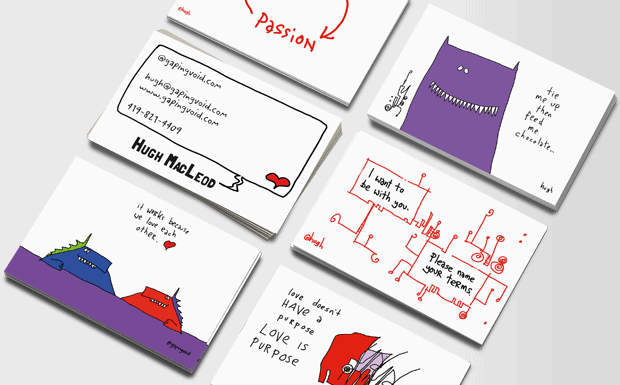 Home / Business Cards / more thoughts on "the cloud"
About a year ago, I was at a geek breakfast in London with Steve Clayton and some other folk, including a few people from Microsoft. Steve and some other geeks were talking about “The Cloud”. At the time Steve was making the transition from working in the UK Partner Division, to working in the “Software & Services” division of Microsoft, which is how the conversation came up. Right then and there I drew the cartoon above. Steve saw it, and right away asked me if he could use the picture for his business card, which he now does. That was the first time I really started paying attention to the term, “The Cloud”. I would by no means call myself an expert or an authority on the subject, but in the last couple of months I’ve been getting increasingly aware of “Cloud Thinking”. It’s seriously interesting to me. As far as I can tell, all three of the big tech companies I know best, Microsoft, Sun and Dell, seem to be betting a lot of their future on The Cloud. It was even just announced recently that Dell was applying to trademark the term, “Cloud Computing”. Heck, even my friends over at Techcrunch are looking to get a piece of the action. 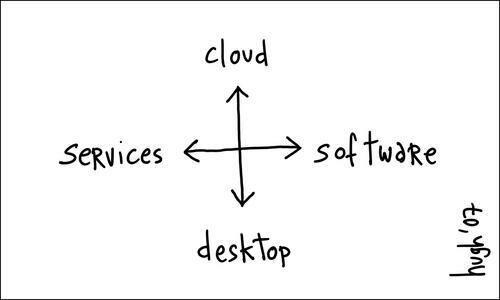 Some analysts say cloud computing represents a sea change in the way computing is done in corporations. Merrill Lynch (MER) estimates that within the next five years, the annual global market for cloud computing will surge to $95 billion. In a May 2008 report, Merrill Lynch estimated that 12% of the worldwide software market would go to the cloud in that period. Those vendors that can adjust their product lines to meet the needs of large cloud computing providers stand to profit. Companies like IBM, Dell (DELL), and Hewlett-Packard (HPQ), for instance, are moving aggressively in this direction. On Aug. 1, IBM said it would spend $360 million to build a cloud computing data center in Research Triangle Park, N.C., bringing to nine its total of cloud computing centers worldwide. Dell is also targeting this market. The computer marker supplies products to some of the largest cloud computing providers and Web 2.0 companies, including Facebook, Microsoft, Amazon, and Yahoo (YHOO). “We created a whole new business just to build custom products for those customers,” Dell CEO Michael Dell says. I was also recently really surprised and delighted about all the discussion my last post, “The_Cloud’s_Best-Kept_Secret”,_seemed_to_generate._Not_just_the_amount_of_discussion,_but_the_quality_of_it,_from_some_of_the_smartest_people_I_know_on_the_planet._People_like_Tim_O’Reilly,_JP_Rangaswami,_Dennis_Howlett,_James_Governor,_all_piping_in._Rock_on. And_of_course,_there’s_the_“Cloud Portraits” I’ve been drawing recently. Clouds, clouds, clouds… Clouds everywhere. Like West Texas in the rainy season etc. What does this all mean? Frankly, I have no idea. I have no intention of becoming a “Cloud Blogger” or whatever, I’m just start to feel a connection here. Connections are my lifeblood. One of my favorite cartoons ever exists simply because I saw a connection between ego, emotion and typography. In 2005 I was the first person to see a connection between $5K English suits and the blogosphere [which back then, I can tell you, A LOT of people thought that was a bit of a stretch]. In 2006 I saw a similar connection between a small South African wine brand and the geek community of Silicon Valley. This year I’m feeling the same sort of connection between all of the work I’ve been doing in the last year. It’s hard to explain- it’s visceral; it’s like you can just smell it, even if it remains so far invisible. It’s just there. A feeling, not quite yet a fact. And a wee voice keeps telling me that The Cloud is at the center of it somehow. Wait and see. That smell… it’s the smell of rain from the approaching Cloud as it kicks up the dust (to badly paraphrase Thoreau). And the Cloud, I don’t see a dinosaur or Blue Monster in it, but perhaps an animal of another kind. Maybe Dell needs a mascot. “the cloud” – an ingenious way for power to travel away from individuals and back to monoliths. Taking this to an even more fundamental level, this is not about the technology. 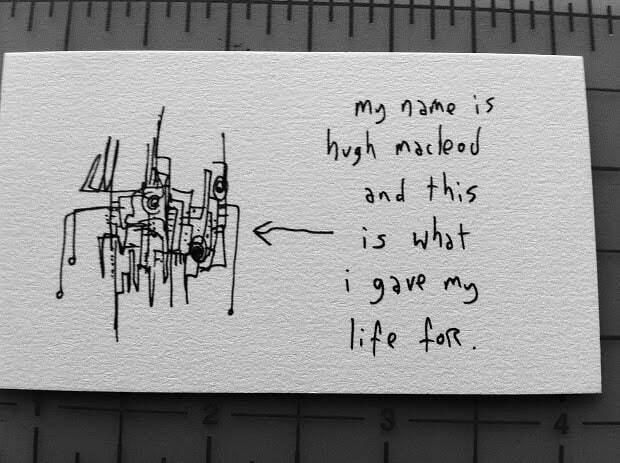 To paraphrase Hugh it is about human interactions. It is about the way our society has evolved to expect a greater degree of mobility — starting with their personal lifestyle (everyone expects to be able to check email or get internet access literally anywhere in the world) and now expect that mobility to transfer to the work environment. 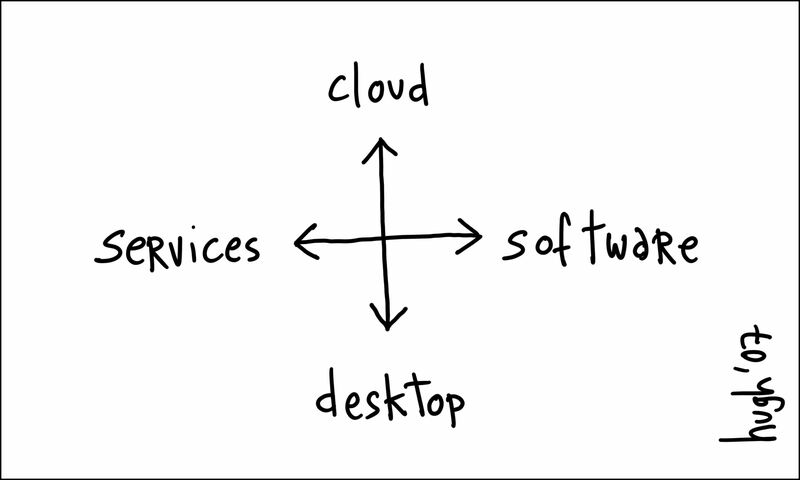 I think the two feed off each other — more clouds = more mobility = more demand for clouds. Well it’s all about the connections ain’t it? There are two things I’d like to add in to the mix. Not just is everything moving into the cloud, it’s also mutating into more adaptable blocks. I can read almost all of my content in a container of my liking because of XML and RSS. The cloud might be the place. Feeds might be the way. It’s screenwriting meets cloud computing. Another interesting connection. At last it will be OK to have our heads where they rightfully belong: in the Cloud. Thanks for the insights Hugh. As the developer of the web’s first Database-as-a-Service provider in 1999, we’re delighted that the industry we helped pioneer is finally gaining the respect it is due. To be sure, on-premise software is never going to disappear, but SaaS is such a vaulable option to companies large and small. We’re looking forward to continued cloud growth! Cloud? Is that the next Web 2.0, SOA, dot-com, client-server or substite-any-other-hype-here? There is a lot of practical problems. The technology is far, far away from the “cloud”. Hugh, your description of things suddenly coming together is soooooooooo good — the pre-eureka moment. Can you cartoon it? Please. Pretty please.